It's hard to believe, but it's that time of year again where the leaves are turning colors. I remember going through a lot of stress last year while dealing with the impending coming of winter. Lucky for me, this year I have all sorts of different things to stress about rather than just silly snow and cold weather. 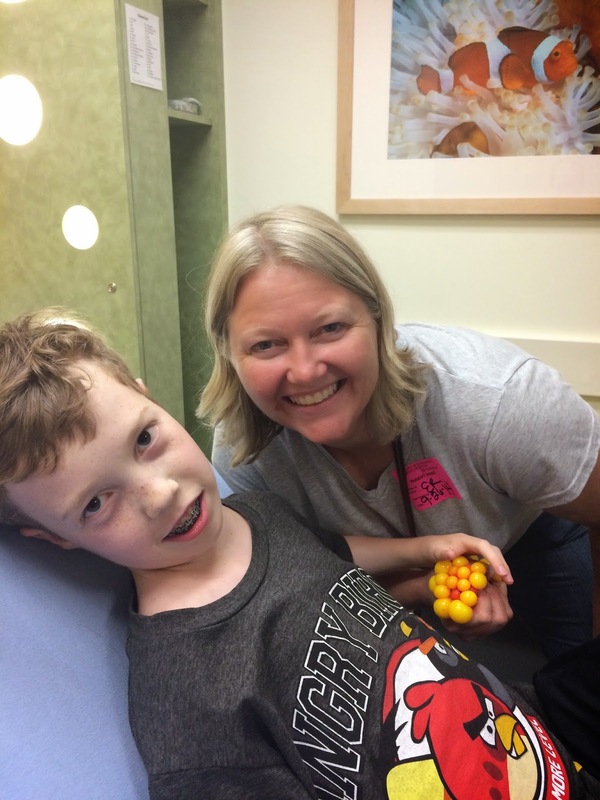 While being evaluated for his heart and liver transplant, the doctors discovered an area in Luke's liver that looked very concerning. 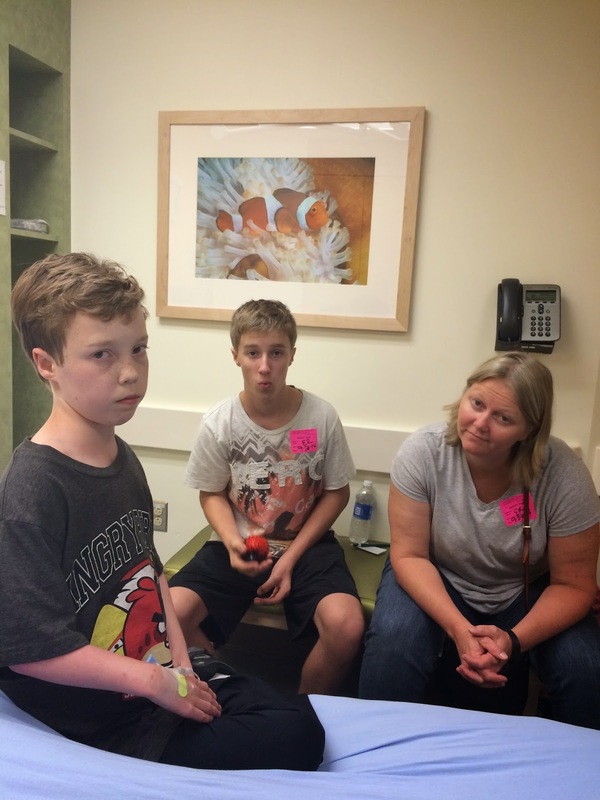 They decided to do a liver biopsy which ended up being a very complicated procedure for Luke. Luke had to have 2 and a half liters of fluid drained from his belly that is there because of his liver problems and then they had to stick a probe through the entire liver to get to the area of concern. The procedure took about 5 hours and Luke woke up in the intensive care unit while still intubated which was extremely stressful for him. He also had two IV's in his arm and Luke really hates IVs. He spent the night in the hospital and before we were discharged we received the good news that the biopsy showed the area of concern wasn't cancer. So that was great news, but it was still a very tough week for Luke. When the boys were little, we spent a lot of time in the hospital getting various surgeries and procedures. Times have changed a lot since then as the hospitals now have wifi throughout the building so I can stay connected at work while sitting next to the bedside. I haven't decided if this is a good or bad thing. Luke was able to go home on Tuesday, but we were concerned about some swelling in his belly on Thursday so we took him back to the emergency room. Luke had to get another IV inserted so they could do blood work. Have I mentioned that Luke REALLY hates getting IVs? But the good news was the doctors didn't see any signs of bleeding or infection complications so we were able to go home again after a few hours. On Friday, Luke received a flu shot in the morning because we needed to get one as soon as possible. 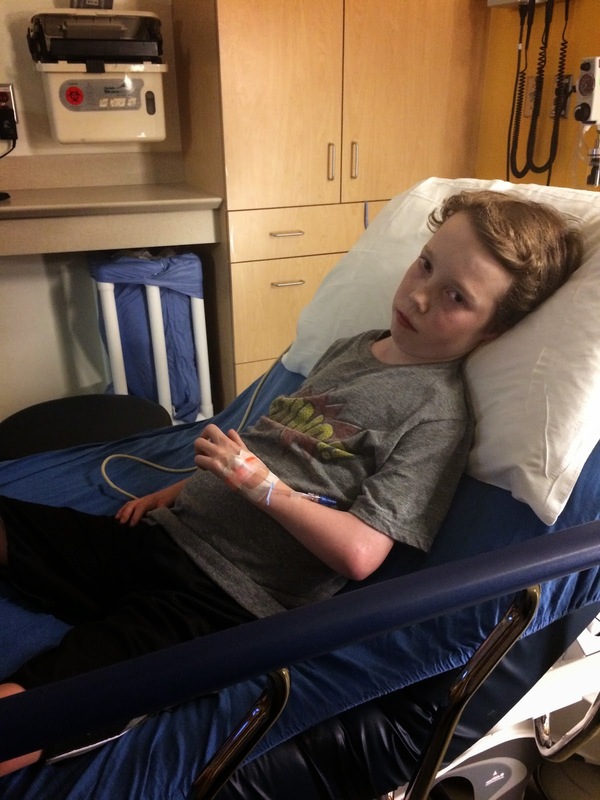 On Friday afternoon, Luke had a fever that spiked up to 102.8. So we were lucky enough to go to the emergency room again and Luke was lucky enough to get another IV again. Have I mentioned how much he hates getting IVs? It reminds me of what it must have been like in medieval times watching your child being interviewed in a torture chamber. Of course the doctors, nurses, and child life staff are wonderful people and do everything they can to make the situation comfortable for Luke, but he has a lot of repressed fears from so much time spent in hospitals when he was little that these procedures are very tough for Luke to endure. But he brightened up after getting the IV placed. Four hours later the doctors were comfortable that the fever may have just been a result of the flu shot and we were able to go home again. On Saturday, Luke was feeling good enough to go outside and get some fresh air. So naturally, we took Sunny to his favorite dog park. Avery has been working really hard with training Sunny. He makes him touch his nose with his tongue before he will throw him the ball. It's been very difficult to get Sunny to understand the concept of what he wants him to do. We normally don't encourage our boys to climb on the skee ball machines at the arcade, but we were so excited to see Luke have the energy to get up there that we didn't have the heart to tell him to get down. We'll start enforcing the rules again next week.